Puck Watch: Bickell hit on Bieksa a Double-Standard? In Game 6 of their Western Conference Quarterfinal matchup, Chicago Blackhawks forward Bryan Bickell knocked Vancouver Canucks' D Kevin Bieksa for a ride in overtime with a high hit reminiscent of the Raffi Torres hit on Brent Seabrook in Game 3. One key difference is that Bieksa had the puck, while Brent Seabrook was standing watching it glide beside him. Another difference, Raffi Torres didn't leave his feet, while Bickell does his best airplane impression. Suggesting that Bickell should be suspended may be a 'leap', but it will be interesting to see if the Chicago and Eastern Media (read: Ron McLean etc...) will organize a public lynching for Bickell as they did for Raffi Torres. Based on the NHL's stance on the Raffi Torres hit, Canucks fans shouldn't hold their breath about any suspension or supplemental discipline. In fact, they shouldn't even hold their breath from the obnoxious Chicago media who think Raffi Torres is the devil (or just a 'gutless' 'idiot'). They seem to think Raffi Torres left his feet and elbowed a taller man. In actuality, Seabrook wasn't watching where he was skating, just like Bieksa on this play. Both defensemen should have had their heads up. Thankfully both are alright and the case can be closed on this. The officiating has been so random, that after Game 6, Canucks' GM Mike Gillis weighed in on the hit as well as the discrepancy in power plays throughout the series. But what will the Chicago media make of Bickell's hit? Will it be a predatory headshot? a blindside hit? Probably not, those Blackhawks can do no wrong. Yes, those poor Blackhawks. Too bad the Chicago media have short memories. And there's too many spears, slashes and goaltender interference examples from Dave Bolland, Dustin Byfuglien, and Jonathan Toews to even mention over the past three years. But those Blackhawks, they certainly are the victims this year aren't they? In fact, they're such clean hockey players, the Canucks can barely get a power play against them. So, while the Chicago media can have fun writing about Roberto Luongo's struggles against the Hawks, and how the Canucks are the bad guys, let's have a little perspective please. Should Dan Hamhuis have rubbed Bolland's head? No. But the guy is nicknamed 'The Rat' for a reason. Should Andrew Ladd have flown like superman at Ryan Kesler? No. There was not a penalty on that Ladd hit from 2009 either by the way. 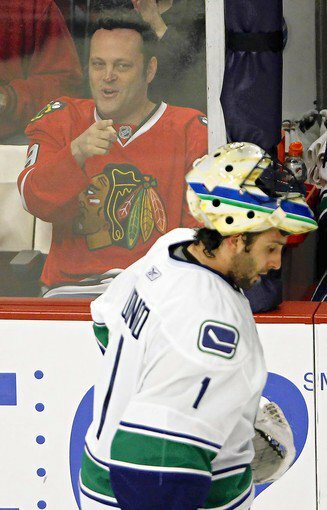 So pardon Canucks' fans if they don't have much sympathy for you, Chicago. They probably feel you're getting the lion's share of calls from officials in this series anyways. The power plays are a staggering 28-16 for Chicago in this series. That's nearly 5 per game for Chicago, and 2.5 per game for Vancouver, well below their season average. Three of the Canucks' power plays were late in games when the teams were separated by 5 goals, so the difference is actually more profound. For those conspiracy theorists out there, imagine where the series would be if the power plays were the other way around? Imagine the swings in momentum without all the 5-3's for Chicago. We're not including the 3rd period penalty shot to Michael Frolik either, or all the non-calls and oddities such as an ice maintenance break that allowed Chicago to rest its players during overtime of Game 6. What the heck was that? You won't hear any of that in Chicago papers though. Just crap like how the Canucks are weak-willed and character-challenged. Yes, its that kind of arrogance from your media that endears you to Canuck nation. Way to win with grace, "eh"? The Vancouver media is notorious in these parts, but I don't recall the them being obnoxious when the Canucks were leading the series 3-0. I don't remember the Chicago media doing anything other than eating humble pie after the first three games of the series either. In any event, the Canucks may very well lose Game 7 and write another sad chapter in their recent history of playoff futility, but their fan base would love nothing better than to shut up the smug and downright cocky Blackhawks like Patrick Kane, and whomever on the bench enjoys taunting injured players like Shawn Thornton and Brendan Morrison. A victory on Tuesday for the Canucks may prove elusive, but would be incredibly sweet, especially if it meant idiots like Steve Rosenbloom have to go back to writing about a team with a real record of futility - the Chicago Cubs. You'd figure a franchise like the Blackhawks would be a bit more humble about their Stanley Cup Championship last spring. It was after all the end of a 49 year drought, and a flash in the pan of 15-20 years of complete and utter failure. Yes, we still remember the Alex Zhamnov and Eric Daze years, no matter how badly you'd like to forget them. And about that humble pie? The Canucks hope to serve that on Tuesday. Well put - the media has been ridiculous in this series (Chicago's anyways). CBC wasn't much better - and no outcry for Bickell on Bieksa. If only the Canucks could ge 6-7 PPs to the Hawks 2. Then we'd see blow outs the other way! I just looked at every penalty called in the series and came up with a 26-16 edge for Chicago in PP's, not 28-16. One of us either added wrong or got wrong info. The Canucks were basically tied with 4 teams during the regular season for 4th most times shorthanded. Chicago was shorthanded the 2nd fewest times. You can argue the difference I suppose, but it's not really shocking that Vancouver would commit more penalties than the Hawks and by a decent margin. Some calls have been missed, but again you have to understand that the refs are human. They don't have replays and 3 camera angles. I'm not a Canucks fan, nor a Blackhawks fan. I think the Bickell hit wasn't a penalty because Bieksa had just touched the puck. Where Torres' hit Seabrook never had, not intended to have possession. I can't believe the Sportscentre clowns called for a Bickell suspension when they so adamantly defended Torres and claimed it (the Seabrook hit) was clean. It's easy to sit there and say "well if the Canucks had more PPs they would be ahead", that's like saying "if we had more goals than the other guys we would have won". I'm a Canadian guy, but I'm not going to jump in the Canucks bed and slob on their nuts. I'm and Oilers fan and hated Torres when he played for us. I think it's pretty disrespectful to elbow Eberle, get suspended then come back and target another guys head. If the league suspends Bickell, then it clearly shows that Cambell just randomly decides what is clean and what isn't. Bickell didn't jut out his elbow on Bieksa, and he left his feet right when he made contact with Bieksa. Where Torres blantantly targeted the head of player without the puck (I know shoulder-to-head checks are legal). I think Bickell shouldn't be suspended to show fairness, but those kind of hits should be avoided if possible. Sav - I took the number of PPs from ESPN box scores. My math may be off - I think Gillis said 27-16 today. The trends of Blackhawks and Canucks penalties could point to predictability, or a season long trend of officiating as well. There's no stopping conspiracy theorists. I'm not a fan of Torres either. I remember a cheap shot he gave Mike Keane years ago in a mean-nothing game late in the season. Oilers were eliminated and the Canucks were going to the playoffs. I don't think Bickell should be suspended, nor will he be (heck, he's injured now anyways). I think the 2 minutes for interference on Seabrook was right - he didn't have the puck. Bieksa did, so I buy that. Not sure I believe either was charging. Either they both are or they aren't. I was just annoyed that the media grills Torres but not Bickell for virtually the same hit. I think there's a double standard at play here. The media has already painted Chicago as cinderella / the good guy in this series, so it's hard to go back on that now. That's also why I wanted to remind some people of the Chicago cheap shots in the previous series. Gillis hasn't forgotten I'm sure. Thanks for your thoughts! I liked this article and I am a Canucks fan. During the crucifixion of Raffi Torres for a whole week by every source you can imagine, be it some members of the press here and just about 100% of the media situated anywhere outside of British Columbia, the league handed down a pass on his hit. During this they said that if 1 factor in their decision was that he had not left his feet. Had he left his feet, their decision would have likely been different. In the video of Bickell/Bieksa you can clearly see Bickell leave his feet as he hits Bieksa and he travels a good 3-4 inches above the ice until he hits the boards. A missed hit in Game 3 by Raffi Torres where he left his feet to hit someone against the boards cost Torres a penalty. This was on an attempted hit, he didn't even actually manage to complete the check. This should have been a charging penalty and in my opinion when a man taller than his opponent leaves his feet to land a blow in hockey it seems like there is added intent and considering he knew he'd be out of the lineup due to hand surgery there was the possibility, in my mind, that hints at the possibility of premeditation. Anyway, whether or not you believe Bickell's hit was worse than Torres' the same or vice versa, Torres was victimized by the media for a week straight, even after the league said it wasn't suspension worthy. Bickell on the other hand seems to be vindicated by the media. The few times it has been reported on outside of this province, all they do is either commend the hit or point to Torres and make it sound like Bieksa had it coming just for wearing a Canucks jersey. 1) Bickell left his feet thats why it should be a penalty. 2) I agree with the comment that refs are human and are going to make mistakes, but they should even out, but the 'Nucks seem to get called for everything and the 'Hawks get away for doing the same stuff. Hopefully it evens out tonight.